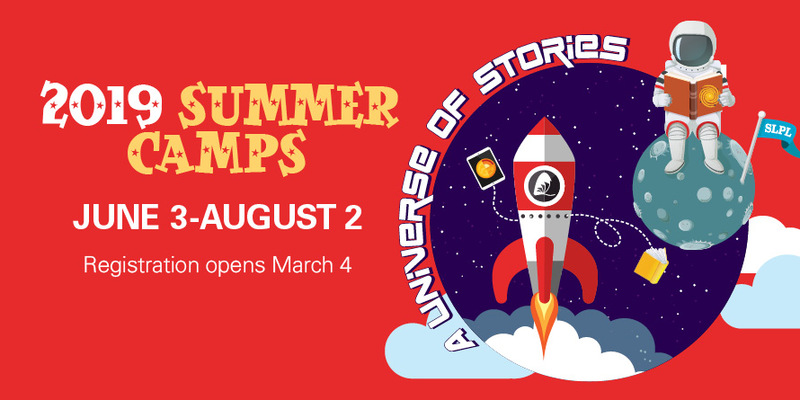 St. Louis Public Library is offering 70 FREE week-long Summer Camps for kids and teens. Space is limited and registration is required. Register through the online application listed below or by picking up an application at any SLPL location. Limit two camps per child. Limit two camps per child. Please indicate your first three choices below. If top camp choices are full, we will attempt to place them with the next choice or on the waiting list. Children will only be released to authorized persons unless otherwise specified by the parent/legal guardian. Check here if your Camper may be released WITHOUT an authorized adult present. This Camper may be released WITHOUT an authorized adult present. The following snacks may be served at the camps: chips (corn, potato, whole grain, etc. ), assorted pretzels or crackers. Please list any food related allergies, physical or behavioral accommodations, etc. Registration is accepted on a first-come, first-served basis and closes one week prior to the first day of camp. We will notify each parent/legal guardian via phone or email regarding enrollment status within seven (7) business days upon receiving your complete application. If admitted, I agree that my child will attend all scheduled camp sessions. An unexcused absence may lead to dismissal from the camp. I understand the Library cannot provide supervision before or after camp. I will make arrangements for my child to arrive ten (10) minutes prior to camp start time for check-in. I understand that I must complete liability or photo release forms for my child and submit on the first day of camp. GET A LIBRARY CARD FOR YOUR CHILD! Cards are free if your child lives in St. Louis City or County or attends a St. Louis City school. For other ways to qualify, contact Customer Service at 314-539-0373. Children Birth to 5 years old: My 1st Library Card allows children under the age of 6 years old to checkout print items from the children’s collection with no overdue fines. No internet use. Children 6-17 years old: Unrestricted privileges allow access to ALL materials at St. Louis Public Library and internet use. Children 6-17 years old: Restricted privileges allow access to the children’s collection only and NO internet use. I agree to be responsible for the return of all Library materials, the payment of fines and fees associated with materials checked out on this card, notifying the Library of any change of name or address and for reporting if the card is lost or stolen. I understand that this Library card cannot be used by another person for internet use, which could result in my Library privileges being revoked. I agree that all information on this application is true and that I will abide by the policies of the St. Louis Public Library.